Ocean Colour Scene are an English Britpop band from Birmingham. 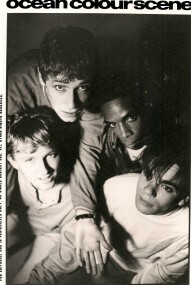 The band were formed after two other local bands called The Boys and Fanatics disbanded. Fanatics released an E.P. titled Suburban Love Songs. * Oscar Harrison (b. 15 April 1965); drums, piano and backing vocals. Damon Minchella was fired by the band in 2003, temporarily replaced by Gary “Mani” Mounfield for a support slot with Stereophonics and then was permanently replaced by Dan Sealey on bass. Another guitarist, Andy Bennett was also added, making them a five-piece. 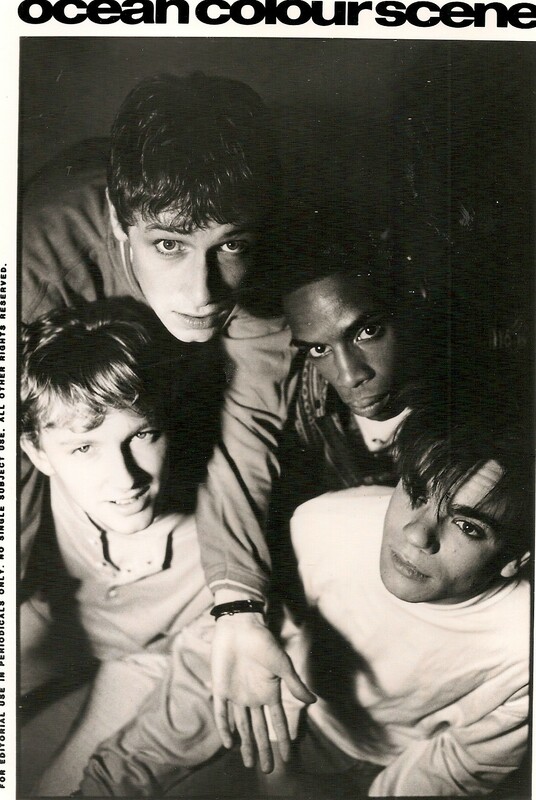 Their first 7″ single was called “Sway” and was released in the early 1990s UK indie era. However, when their record label was swallowed up by larger company Phonogram their eponymous debut was mixed, against the band’s wishes, to fit in with the Madchester musical trend of the time. With the album largely deemed a failure, and with the band in dispute with their record company, they spent several years in the wilderness. With the explosion of the Britpop scene, OCS’s music became nationally and internationally known. Their second album Moseley Shoals was received to critical acclaim, containing four hit singles and reaching the heights of #2 in the UK Albums Chart and the follow up, Marchin’ Already displacing Oasis at the top of the charts. Their song “The Riverboat Song” was featured on Chris Evans’ TFI Friday as the backing music when guests were introduced, and “Hundred Mile High City” and “July” were used in the film Lock, Stock and Two Smoking Barrels and the associated television series. More recently, their first hit single “The Riverboat Song” has been featured in the Vinnie Jones film Strength and Honour. They also played at the largest free standing gig of all time at Knebworth supporting Oasis on 10 and 11 August 1996. Simon Fowler once received a message from a Spanish fan asking permission to use his lyrics “Get up and drink to the days / Ones who are gone in the shortest while” on the gravestone of their brother, who had just died in a car crash. He said afterwards, “That’s got to mean more than going on Top of the Pops”. The lyrics are from “One for The Road” (on Moseley Shoals). In 1998 they headlined their own arena tour and played three sold out nights at Stirling Castle, Scotland. Their arena tour became the biggest selling arena tour of any UK band in 1998. Having undergone lineup changes, the band continue to record and perform, though they have struggled to recapture the success they enjoyed with their breakthrough album Moseley Shoals. Their sound is deliberately retro, and influenced by sixties rock, especially Small Faces. Lead Guitarist Steve Cradock and former bass guitarist Damon Minchella have been long-time members of ex The Jam frontman Paul Weller’s backing group, performing live and contributing to his solo albums before Ocean Colour Scene broke through to a wider audience. Lead singer Simon Fowler has also contributed to Paul Weller’s albums in the past. Cradock and Minchella still regularly perform with Weller, despite Minchella no longer being an active member of Ocean Colour Scene. During their peak (around the time of the Moseley Shoals release) OCS also regularly performed on stage with Noel and Liam Gallagher of Oasis with whom they were on tour at the time. These connections came about mainly due to OCS’s musical abilities, which both Gallaghers and Weller praised greatly. One particular performance of note with the Gallaghers was a storming rendition of The Beatles’ “Day Tripper”, which was included as a live B-Side to the single “The Circle”. The song was also included on the B-side compilation album B-sides, Seasides and Freerides. Noel Gallagher previewed an advance copy of the song during an interview on Radio 1 with DJ Jo Whiley. The interview mainly focused on Oasis’s then-forthcoming gig in the grounds of Knebworth House, of which Ocean Colour Scene were one of the supporting acts. Over 2.6 million  people applied for tickets for the shows, making it the biggest demand for concert tickets in British history. There was a combined audience of over 250,000 people. See Concerts at Knebworth House. As in recent years, the band has recently announced a number of December tour dates, and glamour model Jodie Marsh has announced that they will be playing at her wedding on 1 September which will be filmed for her MTV Show Totally Jodie Marsh: Who’ll Take Her Up the Aisle?. OCS played the OXEGEN festival in Ireland and were extremely well received by the crowd in the Green Room on the Saturday night. The band also played festivals in Japan/Korea during August 2007, where they were well received despite the band themselves thinking they were not well known over there, and also played at the V festival over the weekend of 18 and 19 August 2007. 17 Dec 2006 Live At Birmingham Academy N/A Live album from a Birmingham Carling Academy gig on 17 December 2006. 26 Feb 2007 BBC Sessions N/A Compilation of live performances taken from 1990-1997 on BBC Radio 1. 13 Aug 2007 The Collection N/A An unofficial compilation released on the Spectrum label.